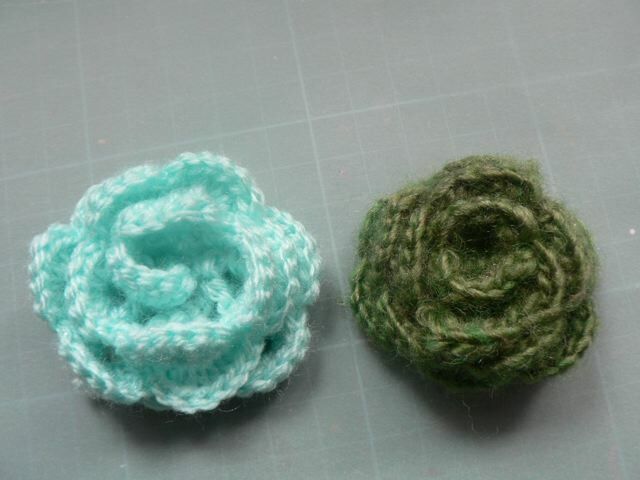 As promised, here is the crochet rose pattern I used. Very pretty, and I did use one, crocheted exactly as the pattern specifies (although I only had a 1.5 mm hook, not a 1.75mm one) on my Masked layout, seen previously. It is a bit tall, but not completely out of line for a scrapbook page, given the paper flowers I also used. But I have been experimenting with other versions. 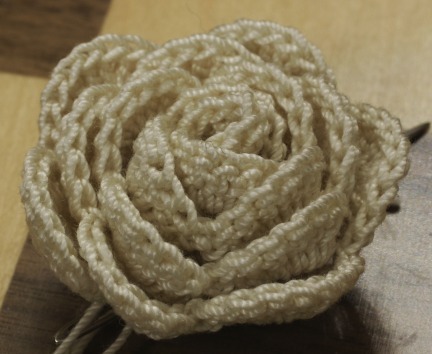 Making the rose with yarn, omitting the middle row, and a size E hook, still gives quite a tall flower. Using the crochet cotton and omitting the middle row gives a flatter flower, perfect for adding to a page, although more pansy-like than rose-like, to my eye. Using baby-weight yard and the 1.5mm hook, more like 40 chains in the beginning row, gives a yarn flower that is also less of a cupped rose but again, easier to add to a page. Overall I love this pattern a lot, and think the rose it produces as specified is gorgeous. It is only a couple of rows, simple stitches, and easy to do. I say give it a go! 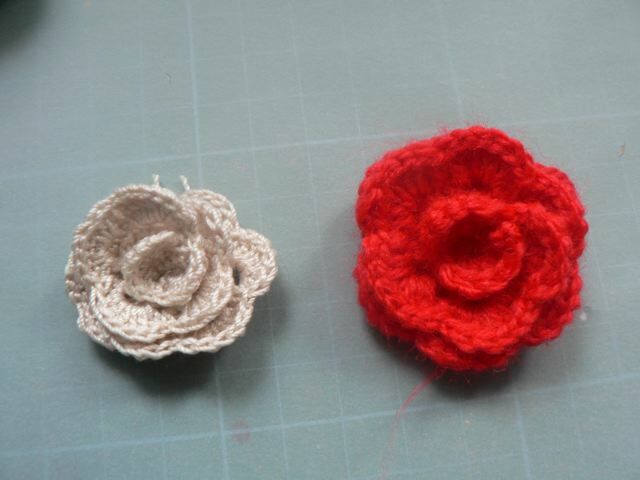 Categories: crochet | Tags: flowers, scrapbooking | Permalink. Thanks so much for this, it’s such a cute rose I must have a go myself. Wish I could do something like crochet or knit….alas, I’m a total klutz when it comes to that, however. I would like to see the whole layout you did. It looks beautiful! Thank you for the pattern. I’ll try it out and let you know how it worked for me. 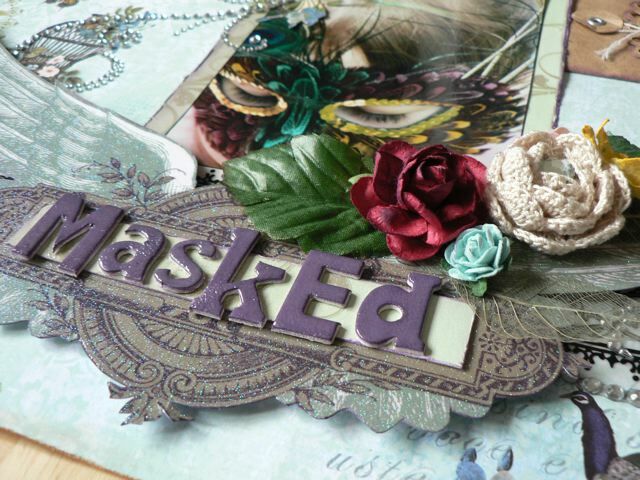 These are lovely … I bet they are quite addictive to make too! I really cannot crochet … I have no idea why … I can knit etc., … but crochet is beyond me! That is beautiful. I’ll conquer crochet one day! Just noticed you have Alison Krauss listed on your blog – what a fabulous voice.